Below is an excerpt from “Crockett’s Coin.” And you can visit the Mikejordanbooks.com Photo Gallery for more images of that fateful night. Red pondered the President’s words as the five dark figures slashed through the night trails, following the sound of huge explosions and fire in the night toward Washington City. He vowed that, upon his return to Falling Water, he and Lewis would reconcile with Elijah. End the stupid feud. And get the family back together again. Red caught a glimpse of the city over one ridge, but Mr. Jefferson pressed closer. The five picked their way up an old game trail along a creek to the top of a hill, the sound of the crackling fire and booms in the night seeming to be just over the hill. Above, the entire sky was filled with fire light, smoke and sparks. The smell of gunpowder was thick. Tiny flakes of soot were falling like flurries of gray-black snow. Red, gun cocked, followed behind, making sure no one had followed them. When they reached the top, none of them could believe the sight. “My God, my God,” Madison cried out. “I’ll be headin’ down the hill a piece, check it out, make sure no one’s around,” Jefferson said, disappearing into the night. 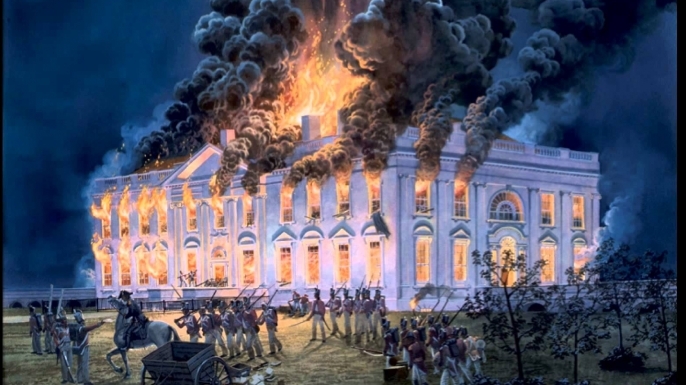 Every section of the city of Washington was ablaze. Columns of smoke and flame reached high into the sky and reflected off the Potomac. Lines of British troops, torches in hand, could be seen between the major buildings, and Madison squinted to make out what had burned. “The President’s Mansion’s afire,” he said softly. Red and Henderson stood silently. Madison meandered away from them, to a place alone behind a scraggly tree. Suddenly, he fell to his knees.